In Topsy-Turvy Town, broccoli rains from the sky, buildings can go for a walk, and robots take baths with children. One little boy can see all of these wonders, but some of his relatives are skeptical and don’t believe they’re real. In this delightful romp through a boy’s imagination, magical things can happen in the most ordinary places. Whimsical illustrations accompany the text, bringing this highly unusual town to life. Living in a world of imagination is fun, but it’s even better when you have a partner to join you. Lucky for this little boy, his mom can see everything, too. 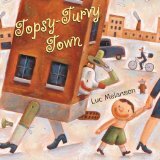 Children will love visiting Topsy-Turvy Town, and maybe they’ll even find some new surprises yet to be discovered where they live.